I normally get a zit or two (or three) when I'm PMSing but for the past 4 months, there seems to be what looks like a pimple pandemic going on my face. I lost count after 20 on my forehead alone. I won't mention the ones on my cheeks....... I've been using the same skincare for years and never had a problem until recently. I finally conceded defeat when nothing worked and consulted Amanda, my friend and a walking skincare encyclopedia (the other being R, a reader here). A few furious (and desperate) exchanges later, the conclusion was unanimous (or rather I agreed with her wise words). Stay off oils and AHA serums. It appears that my skin has gotten hyper sensitive that the slightest oil on its surface causes a flare of outbreak the next day. 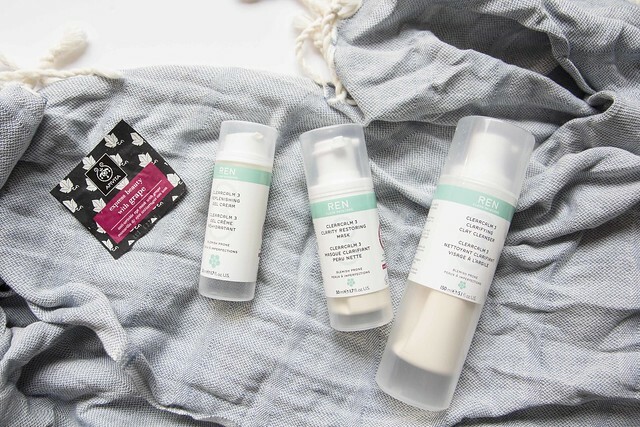 I decided to try my luck with REN's latest skincare products - Clear Calm range. They're not cheap by any means but thankfully, there was a discount code floating around which helped (there's a 10% discount at the moment). I'm being stubborn here but I'm still trying my best to stick to natural products for as long as possible. What's impressive is that my skin ACTUALLY calmed down overnight after using the ClearCalm clarifying clay cleanser and replenishing gel cream. After 2 days of using all three items including the mask, my skin is finally back to normal. Whew. I'm truly amazed and ecstatic because I didn't expect instant results. Instant gratification rocks! The gel cream is not as hydrating as I'd like it to be so I ended up slathering quite a bit more to keep my skin moist. My skin used to be fairly oily but it's getting dryer and dryer as I age. Aging process..... Bummer. The other wonder product is this little tinted spot treatment from Natio which works remarkably quickly. The light beige cream camouflages the redness and treats the zit at the same time. I only wish they make it in various shades to suit all skin tones. Since the color of my skin in winter resembles that of a vampire, the light beige shade works fine on me. It's incredibly affordable AND a little goes a very VERY long way. I've been using this anti-wrinkle eye mask from Apivita on and off for the last 3 years. So far, I haven't found a better alternative. You leave it on overnight and wash it off when you clean your face the next morning. It's light but boy, does it plump up the fine lines and moisturize the eye area. The mask really holds my laughing lines at bay and works a hundred times better than any of the expensive eye creams or serums I've used in the past. A sachet will last at least 3 weeks. Anyone suffers from adult acne lately? What worked for you? I'm having the same problem! Going to try the Ren, thanks, M! Let me know how it works out for you, L.
Milk of magnesia liquid. Seriously. Slather it on, it draws out impurities and is very gentle on the skin. Cheap too!! I've never heard of milk of magnesia before. Thanks for the tip! Honestly it really gets rid of acne. Use it like a face mask then rinse off with tepid water. I'll definitely try it out. Thank you for sharing the tip. I wouldn't ever thought of something as simple as using milk of magnesia. That's great Ren stuff helped! And so fast too. Oooh interesting about the eye mask. Is it scented? Like, you know, offensively so? Eye products can be tricky, had headaches from one, sensitive eyes from another, milia (which is just lovely and a pain in the a** to get rid off). Hmmm if your skin is so dry, it might be the weather+heating combo too (wind in the UK can be brutal). Ren's Evercalm range has a cream, maybe that would be more hydrating and soothing? Once you are completely back to normal obvs, it's best not to fiddle with your skin too much once you see it is reacting and you've found something that works. Also not all natural but La Roche Posay has hydrating creams for problematic skin (Hydraphase there is light and rich version). Do check though I think it also has mineral oil in it and don't know if you react to that? Avene's skin recovery cream has been great, calmed everything down, but I used it because of redness and irritation? If you are looking into all natural products heads up - Apivita has aquavita cream, don't even bother - it just sits on top of your face. Funnily enough, the Apivita masks are working well for me. No side effect so far. There's a very slight scent to the eye mask but nothing major. I get you about milia. I haven't used any eye cream for years now. At least the Apivita eye mask is cheap and most importantly, it works. Alissa, sorry for the late reply too. I've been using AHA for the past 2 years and it worked beautifully. Suddenly, BAM! It's like a volcanic eruption. I'll go and check out mandolin acid peel. Never heard of it either until you've mentioned it.